Abstract Title | Development of a Faculty Development Program at a new regional expansion campus: An innovative integrated and collaborative approach. A regional campus, Mississauga Academy of Medicine (MAM), opened in September 2011 as part of an established medical school at the University of Toronto (UofT) in association with a large, formerly non-teaching hospital (Trillium Health Partners-THP). This expansion required simultaneous engagement of established non-teaching clinicians and rapid training of new teachers. 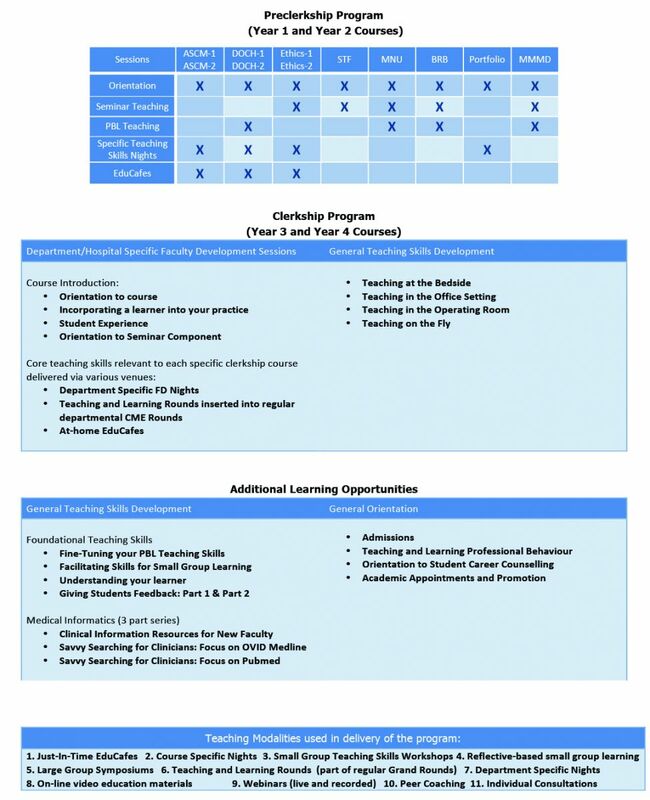 This poster describes the development of a new, customized, locally delivered, Faculty Development (FD) program, designed with unique features to engage and prepare new teachers. A comprehensive situational analysis was conducted that produced an innovative FD Conceptual Framework and 6 principles that guided the development of an integrated and collaborative FD approach. 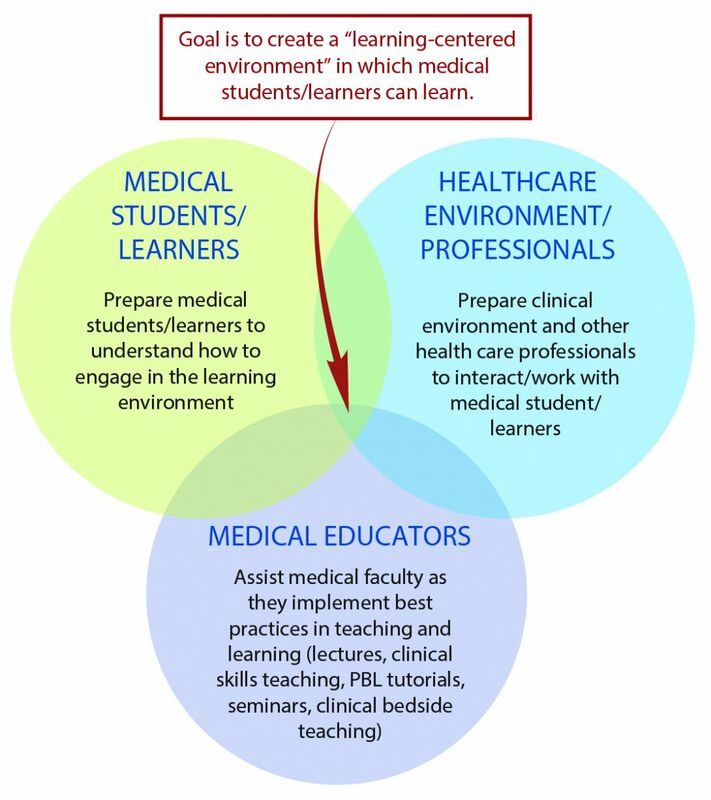 Became familiar with FD Programs/Professional Development Programs that are offered by specialty departments at the Faculty of Medicine, UofT to gain understanding of how best to integrate and collaborate with these existing programs. Became familiar with the different FD Programs offered across Canada and USA for their satellite campuses at Medical Schools and other Higher Education organizations. 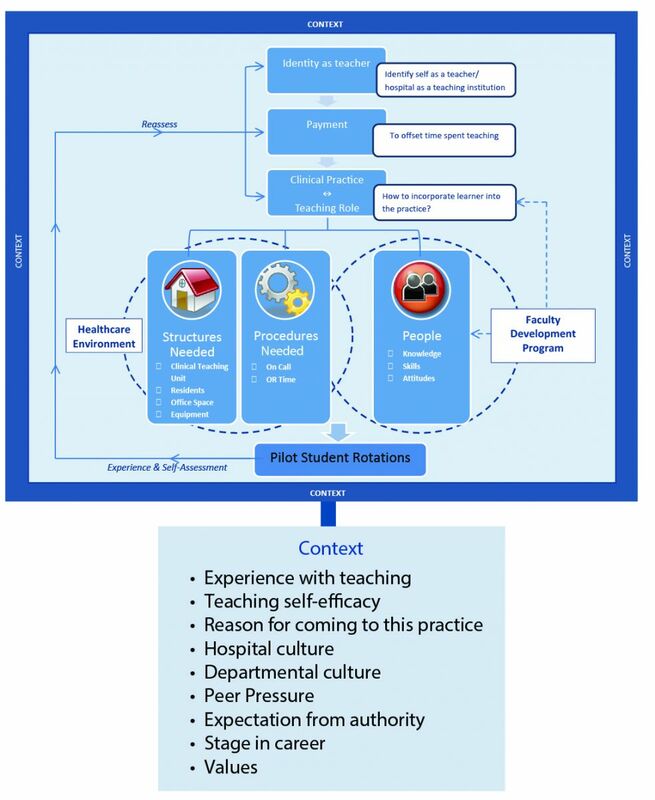 Conceptual Framework adapted by Jana Bajcar, Faculty of Medicine, University of Toronto (2010) from framework developed by Cleo Boyd, Robert Gillespie Academic Skills Centre, University of Toronto at Mississauga. The program offers a wide range of FD sessions annually with 1/3 of the sessions delivered via an innovative “Just-In-Time” FD approach, called EduCafes, that have been extremely popular. To date the program has had over 1900 participants over the past 3 years with 95% of the participants strongly agreed or agreed that the sessions met their expectations. In order for this approach to FD to work, the three components of the Program Conceptual Framework need to be integrated and mutually supportive, as well as collaborative. 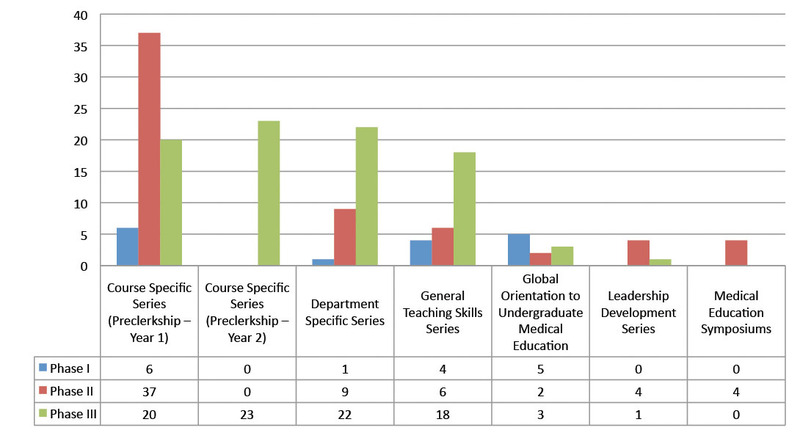 There is value in the creation of a unique customized FD program to meet the specific needs of a developing expansion campus which is demonstrated by the high level of uptake by faculty without the need for monetary compensation to increase attendance. Topics consist of core FD content, but they are contextualized and targeted towards the specific needs of these new teachers. 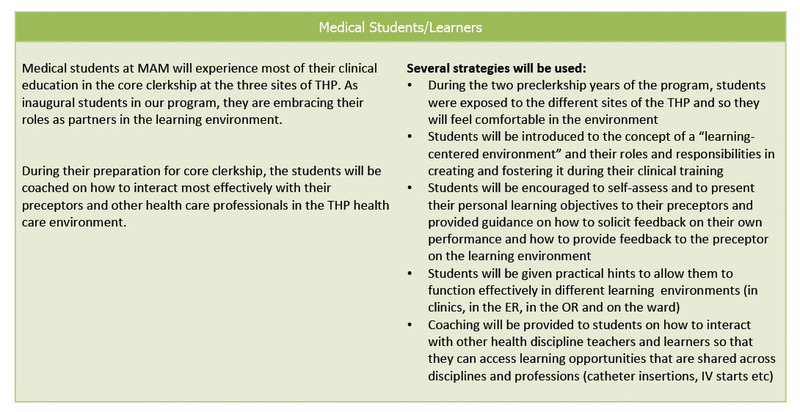 The design and implementation of the FD program needed to be grounded in understanding of and respect for the current education culture at the THP, and to respond to the current priorities of the undergraduate program and the faculty to be developed. There was value to pairing faculty developers from the central campus with local faculty to deliver sessions to build collegiality and local capacity. This mode of delivery is key and it created a “community of practice.” FD opportunities that occurred in a highly relevant “Just-In-Time” temporal relationship to the sessions to be taught was instrumental to uptake and application of strategies learned. 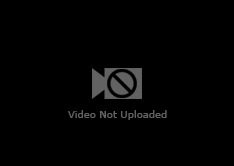 Note: This project has been exempt from Research Ethics Review at the University of Toronto and any conclusions or learnings were not gained through research (for wide external application) but through a QI/QA project carried out in the local context. Development of a Faculty Development Program at a new regional expansion campus: An innovative integrated and collaborative approach.